From time to time I stumble across customers that ask me: – Can’t we just build a “Google search”? Or: – We need to develop new products with great user experience faster! Increasingly over the last decade the world has experienced new products and business models popping up all over the place. They challenge the established players – and often win in the contest of customer engagement. In the meantime our clients (large organizations) come to us and ask us to help them improve – and speed up – their product development process (they rarely ask us to help increase customer engagement or earn more money). They often refer to the Lean Startup process. It seems to me that someone has mistakingly interpreted the fact that new successful products are popping up faster than ever due to approaches like Customer Development and Lean Startup. The main reason is actually due to cheap distribution and available technology that enables almost anyone to compete with anyone – on a global scale. Building a product is easy. Anyone can do that in 2015. Customers sometimes expect us to do this: – Can you teach us Lean Startup – to reduce time to market for a new product – and reach sustainable new revenue faster? This is however where we easily get things wrong. The fact that Lean Startup makes us learn faster doesn’t necessarily mean reducing time to market (we charge early customers to validate ideas, not to make money). In order to create sustainable new revenue we need to solve real problems and excite our customers. That is hard. But we cannot guarantee reaching break even twice as fast. 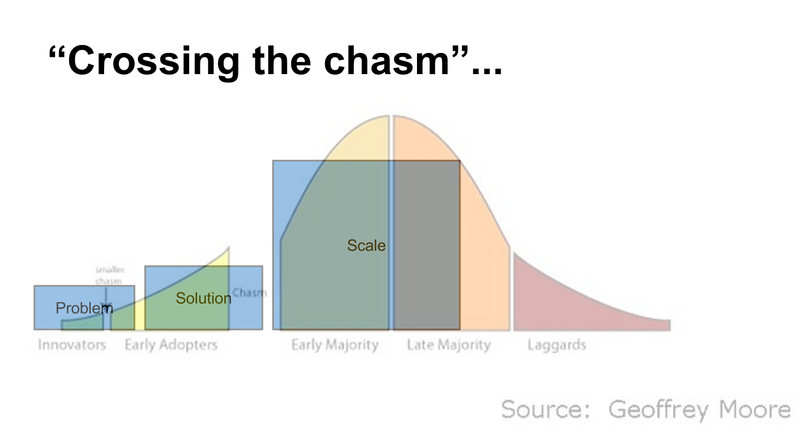 To illustrate my point I have combined the “Crossing the chasm»-illustration from Geoffrey Moore with the process of building a Lean Startup. How fast should we expect to reach the “chasm” and fase our biggest challenge yet of getting into the mainstream? How do we know if we have successfully crossed it? What is your criteria for starting to invest and scale your product, service or business model? This entry was posted in Entrepreneurship, Innovation, Lean Startup, Long term value, Sustainable, Uncategorized. Bookmark the permalink. Cross-posted from The Holy Java. Are you tired of days spent in front of the screen, with no results to show? Have you once again engaged in yak shaving? Today, after having failed previously, I have finally managed to solve a problem while avoiding this trap by following rigorously two guidelines preached by grandmaster programmers. Be warned: Following this approach, you will get a working solution – but you won’t like it. It will be ugly, stained by compromises, far from the elegant solution you wish for. But if your resources are limited and you want to avoid death by too many yaks, this is your only option. But first, what are these guidelines? After we started to accept Bitcoin in 2014 february we became curious what motivates other shopkeepers and service providers in Norway to turn their attention to Bitcoin. We interviewed everyone to share their experiences and expectations with the crypto-currency. www.bitlasers.com – worldwide seller of handheld laser and laser-accessories. Camping Dalen & Camping Dalen Shop: Listed as two in Coinmap, but in fact it’s one. 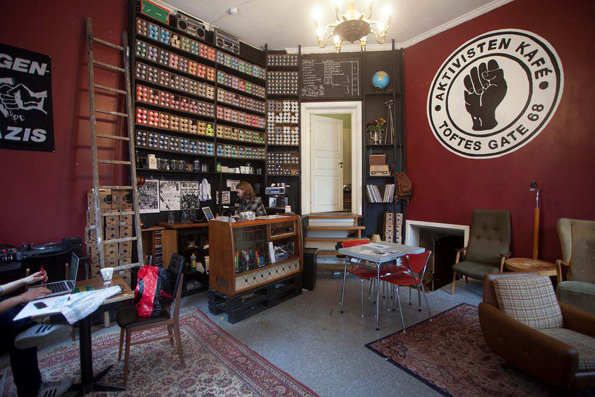 Aktivisten Kafé in Oslo. They also accept Bitcoin. Photo Credit: Scott Cadman. What motivates a business to accept Bitcoin? How often do you have customers paying with Bitcoin? What percentage of your total income came from Bitcoin in the past 12 months? Bitlasers established their business based on Bitcoin-only transactions, and by this they are the only ones who account significant income in Bitcoin. One shop reported to receive less than 5% of their revenues in Bitcoin. A third shop says that by the total turnover Bitcoin makes only an insignificant amount (less than 0.1%). The rest of the shops either did not registered a single Bitcoin-payment or had very few low-volume payment in the last twelve months. Timeline of shops opening up to accept Bitcoin. What do you think about the future of Bitcoin? All of the shops we asked see a bright future in Bitcoin payments. They state that the usability for online transactions is really good for and it is very suitable for small and medium-sized transactions. Some said that Bitcoin is more suitable for payment than credit card or cash. Some believe that when the price of Bitcoin stabilizes we will see an increase in transactions and we can expect a steady growth in the number of users. Almost all of them mentioned however, that in order for Bitcoin to succeed we need more places that accepts it as payment, and more people to spend it. Although Hans Christian Holte, director general of taxation says that Bitcoin is not a currency, Scandianvia’s biggest Bitcoin exchange place Justcoin.no reached nearly 67 000 registered users since they opened in 2013 spring. This sounds like rapid growth, but it also means that only around 1% of population of Norway has bitcoin. (Norway has 5,136,700 inhabitants based on 2013 demographic data). We did a research by interviewing randomly chosen people of all age in the streets of Oslo to find out more about Norwegians’ knowledge about Bitcoin and willingness in using it as payment. We also launched an online survey with the same questions, targeted to people living in Norway. It turned out that 46 % of the people have never even heard about Bitcoin. And I personally think it will take a LOT of time. While transferring Bitcoin online takes just as little as transferring any other currency through your net-bank, Bitcoin has some serious usability issues when it comes to point of sales payment. Paying for a coffee at a bar with cash or credit card takes around 10 seconds, but if you want to pay with Bitcoin it will literally take minutes as you have to do an online transfer and get verified by the seller. But as we said in our previous post it is nevertheless a great fun to be with, experiment and watch where it will grow. This entry was posted in Uncategorized and tagged bitcoin, innovation. Bookmark the permalink. When a team member first hears me say, “It is more important to be consistent than to be correct”, in order to settle a debate about which fork in the road is the one best traveled, their reaction is the same. An incredulous look, as they might gawk at a fool; though perhaps I am. Er det kun Salg og Marked som skal tenke på kundene? Og hvorfor vil de det? Her er del 2 av tankeeksperimentet som omhandler selskapene Generasjon X og Generation Y.
Del én: Kundedrevet virksomhetsstyring? Er det ikke det vi alltid har gjort? I denne artikkelen ønsker forfatteren å debattere hvorfor bedrifter ender opp med å la interne problemer/behov styre handlinger og beslutninger, fremfor å være kundedrevet, som de fleste sier at de ønsker å være. Generation Y har en annen tilnærming hvor de organiserer seg ift sine primærmålgrupper, selvom de sliter med de samme utfordringene. Diskusjoner starter utenifra og innover. ES6 is not fully implemented in any browser yet, even the specifications are not finalized. Still there are a number of good options for how to use ES6 features today. We use es6ify which relies on Google’s traceur. Together with Browserify and Gulp we transpile our ES6 code to ES5. Our set up is availble in our GitHub repo with helper methods for some of the tasks. There you can also find a solutions branch with suggestions for how to solve the tasks. There is a long list of features and improvements in EcmaScript 6 (see the ES6 draft or the features supported by Traceur). In this workshop we made a selection of features to go through; template literals, default parameters, arrow functions, destructuring, rest parameters, spread operator and generators. Management of an organisation that is quite obviously based around products but chooses to see everything as projects creates a mismatch between how an organisation is run and what they try to accomplish. The structure in use to enable the accomplishment of work defines the foundation which future work is built on. There are several lessons to be extracted from that quote about trying and failing, iterating, feedback loops, starting over, et cetera. Our focus is on the obvious one; do not build on unstable foundation. A project by definition is something that should be accomplished with a fixed amount of resources within a fixed timeframe. When the goals are achieved the project is dee-oh-en-ee: done. Ergo projects have limited lifespans, which is something products do not. A product strives to live as long as it can. If it cannot pay for its own way in terms of further development and operational costs it is proven to not have a place in the market in its current form. A few trends that emerge every time I work with an organisation that has structured themselves around projects can be summarised by this little tale about a man collecting sticks. I have recently published quite a popular blog post Frustration-Driven Development – Towards DevOps, Lean, Clojure. My good colleague Tom Bang has pointed out that it actually shows nicely the reasons why many of us work for Iterate and why Iterate does what and how it does. I therefore republish it here under a modified name. A post about development practices, speed, and frustration. My wife has mentioned that she likes my passion for doing things right in software development. That made me thinking, why do I actually care so much and do not just enjoy the coding itself? It boils down to that I am not happy until my code is in production. Seeking the satisfaction of having my code used by and helping people while trying to eliminate all unnecessary mental drain is behind all the practices that I embrace and evangelize. It’s a drug I like to take often, in small doses. So how does this relate to DevOps, Continuous Delivery, testing, single-piece-flow, Lean Startup, Clojure? It is simple. This entry was posted in Technology, Uncategorized. Bookmark the permalink. Lykkes du – så del med andre hva du har lært. Deler du, så lærer du og det tror jeg er en god formel! Det er viktig å finne engasjement på mange nivåer som vil det samme. Du trenger støtte på høyeste hold, på ledernivå og 2-3 operative som motor. Dvs. at man må ha 5-6 personer som finner ut av at dette skal skje og bli enige om dette. Hovedargumentet for å skille ut er å beskytte funding og passe på at ressurser ikke dras i flere retninger. Schibsted har mange gode eksempler på dette, eks. vis VG når de skulle «vinne» kampen på mobil, startet de et eget AS. I 2013 tok de det inn igjen siden mobil nå er blitt en så stor del og kan måle seg med avis delen. De skilte nylig ut VGTV og kommer til å føre det tilbake igjen når det er oppe å går. Nokia kjører et super hemmelig prosjekt som skal rette opp skuta. Norsk sjef. De er skilt ut som et eget miljø, med egne budsjetter og med topplederstøtte gjennom at Elop og noen andre VP sitter direkte i styringsgruppen. De stiller nær sakt aldri i møter, men alle vet at de bare er en telefon unna om noen prøver seg på å stjele funding eller trekke ut ressurser. #3. Utholdenhet og utålmodighet, på en gang! Det er utrolig vanskelig å lykkes med nye ting! Hva skjer om man er utholdende uten å være utålmodig? Jo, mange titalls, kansje hundre millioner kan være bruket før noen setter ned foten. Det å finne beslutningstakere og «stake holders» som har akkurat den perfekte balansen mellom utholdende og utålmodig er sjeldent. Finner du en så hold godt fast i denne/disse! Å finne miljøer som klarer å komme frem med «udødelige» ideer. Dvs, på tross av alle som prøver å rive ned, hindre, utsette osv. så klarer miljøet å sjonglere stake holders, produktet, marked og penger på en unik måte. Disse personen vet at om de feiler på bare en, så faller alt. I en 2D verden trer man inn i et terreng hvor du bare ser det som er rett fremfor deg. Du ser et produkt, en tjeneste eller en forretningsmodell, men du ser egentlig ikke så godt hva kunden egentlig prøver å få gjort, hvordan endrer dette vår posisjon i markedet, hvordan kan vi gi kunden mer verdi? Hvorfor har droner tatt over krigsmarkene? Jo, de sparer potensielt krigerens eget liv, men det er noe mer her. De gir beslutningstakerne en 3D forståelse av situasjonen, hva som er under oppseiling og ikke minst: Hva betyr det av endringer i planen! Jeg mener man kan oppnå dette 3D bildet gjennom å bruke flere personer med ulik bakgrunn og erfaringer som sammen diskuterer og lager planer innen et gitt området. Disse må relativt raskt kunne settes ut «live» gjennom simulering og testing i terrenget – på ekte kunder. Gjennom dette kan du som tilegne deg denne evnen til å forstå ditt marked i 3D. Når brenner det akkurat passe under beina på «stake holders»? Når er markedet klart for noe nytt? Når passer det for intraprenøren å ta egen risiko (kan jo miste jobben/posisjonen)? Når har org nok selvtillit (det har jo vært noen fiaskoer i historien bak)? Tror du lett kan finne 20 viktige NÅR faktorer og de skal alle stemme…..det er sjeldent, temmelig sjeldent, dessverre. Deler du så lærer du og det tror jeg er en god formel! This entry was posted in Entrepreneurship, Experimentation, Innovation, Leadership, Lean, Uncategorized and tagged Business Development, Erfaringer, Forretningsutvikling, lean startup, Tips. Bookmark the permalink. Dear System Developer. I have seen the agony and frustration in your face. The every day context switching and inability to concentrate on one task at the time. Many years ago I felt it myself, back when I also did programming. As project manager I want to help you. But, in order to achieve our common goal, you need to help me back. I need you to help the tester and myself create specifications that make tasks small and independent. Only then we can achieve our common goal of a continuous single flow of valuable features delivered to the customer. No more headaches. In this blog article I would like to discuss the concept of flow in software development by sharing my experiences from a current assignment. I want to show you how our inability to define small, independent, functional requirements ends up with headaches and stress. Even though the concept of feedback loops is a central part of this, I will hand it to my good friend and colleague Rune Larsen to explain more about Knowing your feedback loop. When you finish reading this article I want you to ask yourself this question: Can we deliver more and better if we slow down and do one thing at a time (per developer)?